The test itself is just a hazy memory. I don't really remember the sit-ups, the push-ups or even the flexed arm hang. 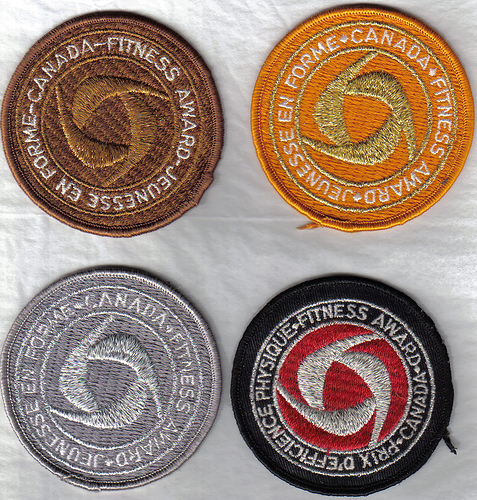 In fact, there are only two things I remember clearly about the Canada Fitness Program: giving up on the endurance run after just one lap and the badges. The badges were the worst part. In first and second grade, long before being able to identify name brand clothing was an indicator of social status, there were the badges. They marked you. If you had one, you were popular. If you didn't, you were nothing. Even my older brother, Andrew, whose athletic (in)ability was comparable to my own, wore a silver badge proudly on his windbreaker. My own participation pin was a mark of shame. I hardly think it's an exaggeration when I say that the Canada Fitness Test fucked me up for life. It convinced me, at the tender age of seven, that I wasn't good enough. For the next eight years, my head would be the target of dodgeballs, my name would religiously be the last one called last for teams, I would be slammed against lockers in the change room and I was always, it seemed, on the brink of tears. Twenty years later, I'm tired of being afraid. So, with this in mind, I'm declaring 2012 the Year of the Physical Fitness Challenge. But instead of trying to get super ripped and work out every day (which, let's face it, is just a boring New Year's Resolution that's bound for failure) this is going to be a year about challenging myself mentally. It sounds counterintuitive, I know, but let me explain: trying new physical activities still terrifies me. To this day, I refuse to play team sports. I go to the gym regularly, but every time I try a new class I'm convinced that everyone is staring at me. (And if the instructor talks directly to me, it's unlikely that I'll go a second time. When I tried to join an advanced highland dance class a couple of years ago and the instructor suggested that I should attend the intermediate class instead, I never returned.) When I went to a gym for the first time at the age of 20, I started hyperventilating. At 22, when I took a surfing lesson in Australia, I spent the majority of the lesson collapsed on the beach crying. I refuse to work out with Jay, because I'm afraid that even he will make fun of me. But if my time in pouring concrete in Vanuatu, hiking in Peru, or hauling pharmaceuticals up riverbanks in Guyana has taught me anything, it's that what I lack in natural athletic ability, I more than make up for in mental endurance. (This is probably why I've always loved running.) This year is going to be all about playing to my strength--finding the mental willpower to participate in activities that have previously pushed me to the edge. This year, I'm going to go rock climbing, I'm going to learn to kayak, I'm going to run a half marathon, and hell, I might even face my ultimate fear and go scuba diving. This year, I'm going to earn my badge my own way. Oh my god. I'm so delighted by this post, because I was just talking to my husband about that stupid Canada Fitness test today, and intend to do another post on how much exercise truly blows, even if it's good for us. I enjoyed reading your memories of the torture!